Get nüüd and maximize your mini. The LifeProf nüüd case for iPad mini is built with everything LifeProof knows about mobile device protection and usability, creating the thinnest, lightest, most functional all-protective case ever conceived for iPad mini. iPad mini is a powerful, thin, light and full-featured mobile device, and nüüd for iPad mini allows full access to every function and feature while protecting it from day-to-day adventures and accidents. The LifeProof nüüd defends your mini from drops and shocks, without needing a screen cover. That way, iPad mini’s sensitive touch and brilliant display look, feel and respond just as they were designed. nüüd screenless technology is the first of its kind. By forming a waterproof seal with the touchscreen, nüüd protects iPad mini while leaving the screen open for direct touch. Yes, you can touch the touchscreen. Water Proof, Dirt Proof, Snow Proof and Shock Proof. 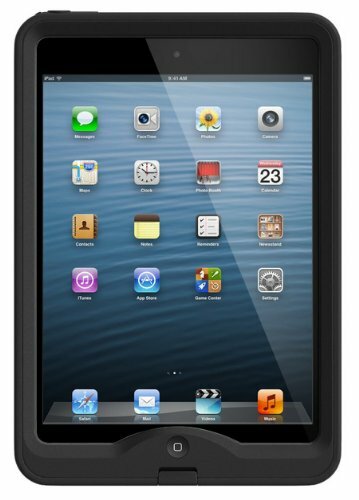 With LifeProof, you’re free to use your iPad mini every day, everywhere for everything. nüüd boasts enhanced sound, CrystalClear optics and full access to every control, all packed into the sleekest, slimmest case ever made for iPad mini. Your nüüd case includes a removable shoulder strap so you can keep your iPad mini secure by your side. The built-in accessory anchor ports accept an array of custom iPad mini accessories. nüüd is an all-protective case that blends seamlessly and works flawlessly with your iPad mini. You won’t notice it’s there, until you’re glad it is.